As the weather cools off, I start thinking about things like leaves and crisp weather but Weston thinks about one very important thing — Halloween! He is a huge fan of Halloween (as long as it doesn’t get too scary or spooky) so as soon as he figures out that it’s coming soon, he’s ready. Soon is a relative term when you’re a kid so he’s already been talking about it for a week or so. 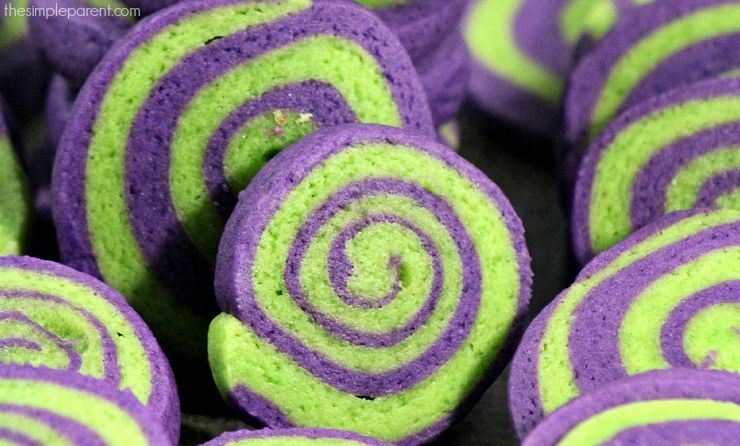 It inspired us to have a little fun and make Halloween Pinwheel Cookies! 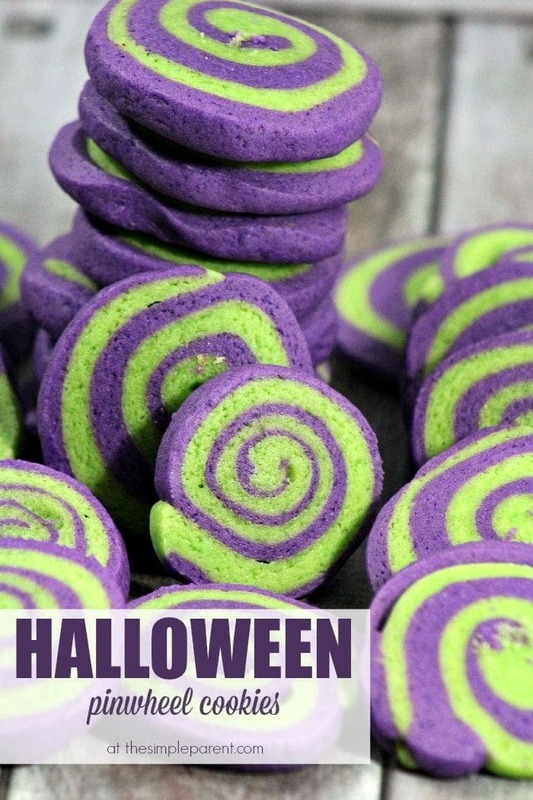 While candy is definitely the focus when it comes to Halloween, when it comes to cute and festive goodies, I’m all about cookies and cupcakes. 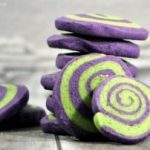 With the green and purple, these cookies are such a fun treat to make for the kids! EDITED to add: This year I’ve adjusted the recipe slightly because I’ve been having better success slicing them to about 1/3″ thick. In a mixing bowl, use an electric mixer to beat the butter and sugar together until smooth and fluffy. Add the eggs and vanilla and mix until combined. In a separate mixing bowl, mix together the dry ingredients (flour, baking powder, and salt. Add half of the dry ingredients to the wet mixture. Mix until combined. Then add the remaining half and mix to combine. Divide the dough in half and place each half in a separate bowl. 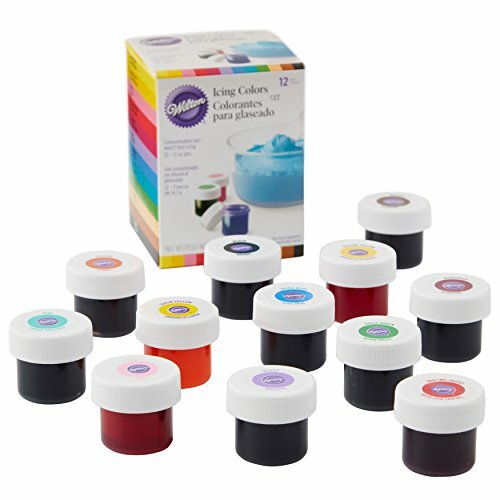 Add green gel food coloring to one batch of dough and knead with your hands until you get the desired color. 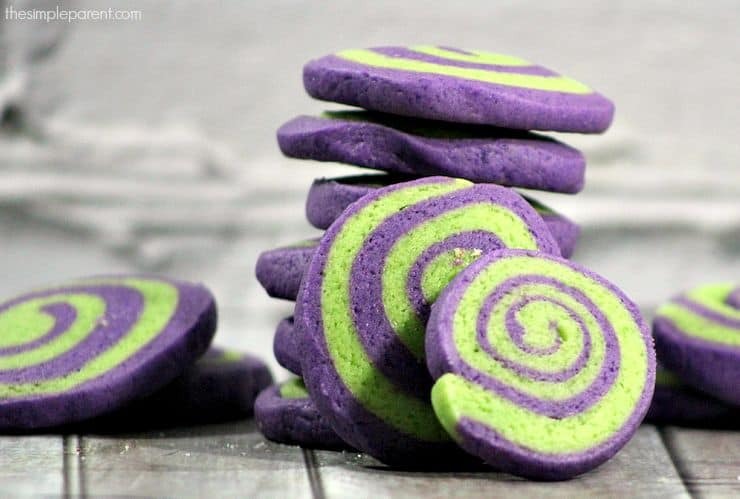 Repeat with the other half of the dough using the purple gel food coloring. Roll each batch of dough into a bowl and wrap tightly in plastic wrap. Refrigerate for at least 1 hour. Unwrap the purple dough and sprinkle with flour. Roll out into a rectangle and set aside. Repeat with the green cookie dough. Use your rolling pin to roll the two doughs together a bit. Then use a knife to trim the edges into straight lines, leaving you with a rectangle shape. Allow to cool for 5 minutes before placing on a wire cooling rack to cool completely. Dust counter or cutting board and rolling pin lightly with flour. Allow to cool for 5 minutes before placing on a wire cooling rack to cool completely. Then enjoy! YesI do! Thank you! 1/2 inch and place 2 inches apart! Sometimes that mom brain just takes over!! I will update now! This makes about 24-36 cookies depending on the slice thickness. If you like thicker cookies I’d say this would do about 2 dozen for you. I just mixed these up and I’m wondering about the amount of flour. The dough is just crumbling in my hands and was almost impossible to put together. I have had this happen once or twice as well. I’ve found that my weather (the humidity) sometimes has an impact on my cookies. I will add to add it in increments until you get the desired consistency. It seems to be the approach that works best.